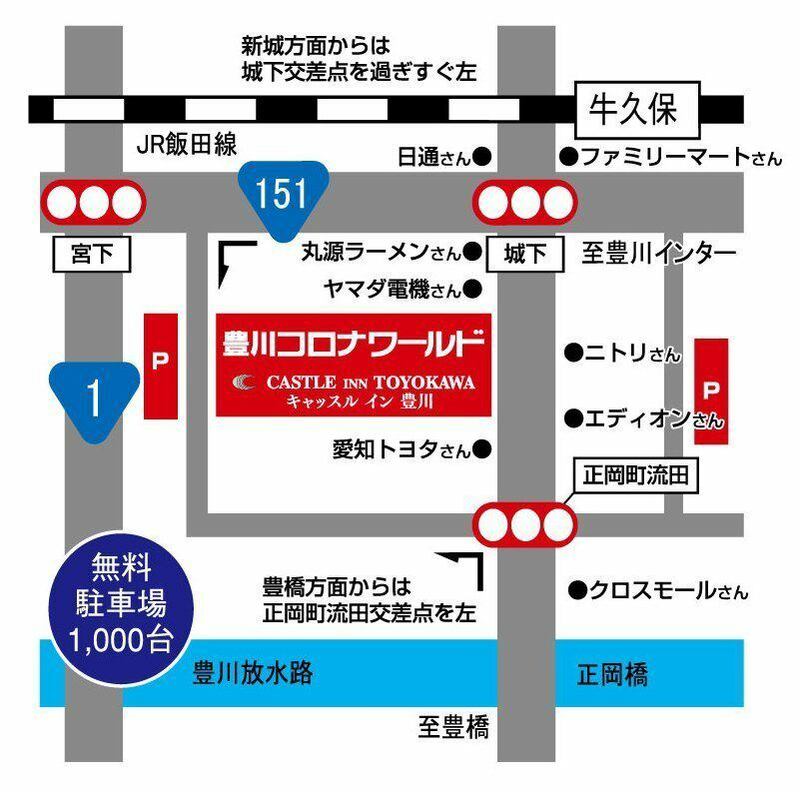 15 minutes from Tomei Expressway Toyokawa IC.15 minutes on foot from JR Iida Line Ushikubo Station.It is 15 minutes by car from JR Toyohashi Station. Shuttle bus service.Toyohashi Eki-mae and Between Toyokawa Korona World and.Toyohashi Eki-mae (east exit) Every hour from 00 am to 1 pm every hour.It runs every 30 minutes every hour from 8:30 in the Korona World morning to 20:30 in the evening.※Depending on the weather and traffic conditions, it may be canceled due to delay. Free parking available.45 underground parking lots for hotel and 1,000 for Toyokawa Korona World shared. Take the Toyohashi Station ticket gate and proceed to the east exit. A red bus is a landmark. ※The bus model may be different depending on periodic inspection etc. Before Mitsubishi UFJ Bank, entrance to the Underground Communication Passage will be the stop. The bus stop has already been removed, but the shuttle bus will stop. The shuttle bus is waiting at Toyohashi Station East Exit side, Mitsubishi Tokyo UFJ Bank ATM in front. ※Depending on the weather and traffic conditions, it may be delayed or canceled. If you are coming by a large-sized vehicle such as a truck, please let us know about parking lots.